Reviews | Regal Cinnamon Sugar - 16 oz. Regal Cinnamon Sugar - 16 oz. Treat your patrons to the spicy-sweet blend of cinnamon and sugar in your breakfast items or desserts with this Regal cinnamon sugar! It's perfect for topping quick bread, toast, yogurt, and fruits. The perfect blend for baking, this is an essential spice for making irresistible coffee cakes, cinnamon rolls, French toast, muffins, and much more. Mix it with melted butter for quick pancake syrup, and it's even great for dusting on top of a pie! Wow these are amazing on bread. I can even use them on plain toast with butter and a bit of this sugar when I'm too lazy to make french toast. Needed something sweeter for our desserts than regular cinnamon, this worked well, not too sweet, great as part of a recipe, or my kids sprinkle in on cereal. Webstaurant's Regal Cinnamon Sugar adds the perfect sweet and cinnamony outside crunch to our famous handcrafted churro marshmallows! The cinnamon crunch makes these mallows perfect for snacking or as an addition to your hot chocolate! Yum! Great Product awesome even mixture of the two spices. This awesome spice is great for toast, french toast, and some hot beverages including coffee and cider. Perfect blend of sugar/cinnamon. Great for breakfast pastries and desserts. Has a good flavor, and comes with a budget friendly price tag. Will be ordering again. Get your kids interested in a good home cooked meal again with this cinnamon/sugar. Great on French toast, it also goes well on toast that has been lightly topped with peanut butter. Never a wrong choice if you e got a house full of hungry children. How hard is it to make cinnamon sugar right? I bought this as a pure convenience item for when I go bake and cook in my kids classes weekly. What a time saver! Good flavor...good mix ratio...Plus it is a good simple step to skip. I will be ordering another one for the middle school classes. Great time saver for a great price! I know I can diy cinnamon sugar but why bother when I have the convenience of purchasing this product and the taste is great on my yams! Do you wanna go back to your childhood? I have some memories of cinnamon, butter and sugar on a piece of toasted white bread. It is that good. A good product, but I seem to get a lot more of the cinnamon flavor than the sugar. I know for some this may be a plus, but I found that it was a little lacking in the sweetness department. Just a heads up! We love this Regal cinnamon sugar, it is perfect for our snickerdoodle cookies. The container is perfect for storing in our kitchen, it is light weight and the right combination of cinnamon and sugar! I got this because aa much cinnamon toast as i make, i tire from tediously having to mix the sugar and cinnamon perfectly together, now i don't have to! This is great addition to any bakers collection! Perfect mixture of sweetness of sugar and spiciness of cinnamon! Make work one step easier. Great price too! Cinnamon sugar helps cut down on one of the steps when making rugalach cookies. After rolling out the dough, sprinkling it with the cinnamon sugar - blended to perfection unlike what I used to do with mixing the two myself - then adding , jam, raisins and nuts, rolling it all up and then cutting almost all the way through, I bake it to a golden brown. Yum! Cinnamon sugar can be sprinkled on French toast, too for a delicious breakfast. Lots of uses! Okay. Let's be honest. This is something you could easily make at home - however, what makes this purchase worth it (beyond the obvious of not NEEDING to make it yourself) is that it comes in a nice reusable container with a professionally printed label. This is great for me because it nicely matches everything else in my spice cabinet. Great to have in your pantry for baking! Also can use on things like applesauce, sprinkled in coffee, or on buttered toast. Has two openings for either sprinkling or spooning out. Webstaurant's Regal Cinnamon Sugar brand always tastes better than most other brand I have tried. This is a convenient size for my spice cabinet. Tastes great. This sugar cinnamon mix is awesome! I use it for my kids for cinnamon bagels or toast, over rice pudding for a great treat. Tastes great and is a great value for the amount you get. 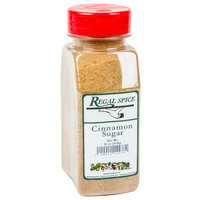 I use this cinnamon sugar to top off the Cinnabon mix I purchased on this site and I love it! It comes out evenly ( same parts sugar and cinnamon) and tastes delicious! This mixture is the perfect ratio of cinnamon and sugar. At this price, you can use it every day on toast, but to impress your house guests, try mixing it in maple syrup for your own homemade blend. This is also so handy when I’m making snicker doodles so that the topping is already pre-mixed for me when I have large batches of cookies to make. This is great cinnamon sugar and tastes great! My only concern with this is that when I took it out of the box it appeared at first as if it were already open and half used since the container is only half filled (16 oz. by weight). Also, the security seal wasn’t the strongest seal - mine wasn’t even on because it came off into the cap when I opened it. I enjoy all the Regal spices that I have purchase here. I like the convenience of having cinnamon and sugar already mixed and on hand. The regal cinnamon sugar pre-mix is a great timesaver and a fantastic quality product. I would recommend this to anyone looking for a great addition to the pantry. Great item, we happy to add this item to our kictchen & food options. Great brand, very happy with this purchase. We will be buying more. This regal cinnamon sugar tastes very fresh. This is a great product to have. It's great to not have to mix your own cinnamon sugar. This has the right amount of mix between the both. this is great cinnamon sugar, it tastes nice, i got it in the bigger container than thought, but it is perfectly blended. a nice quality. A full pound of pre mixed cinnamon and sugar. This is great to sprinkle on top of breads and desserts. The cinnamon has tons of fresh flavor and aroma. This product saves so much time in desserts its scary! Perfect in a batch of pancakes or waffles or my favorite when making donuts just speinkle on and you are done! This cinnamon sugar is great. It tastes delicious and is very fresh. I use mine often whenever I make french toast or something like peach cobbler. I'm always using spices. This will not go to waste. It is great that I can get these delivered directly to my house. It's one less thing to grab at the store. A convient way to use sugar and cinnamon in recipes. We use this to make our cinnamon bun preparation one step easier. Every little thing helps. This is a good product at a great price. It can be used on or in many things. It was tasty in some cinnamon rolls. We're very pleased with this product from WEBstaurantStore it's perfect for toast and homemade cake donuts we put it on French toast as well good taste and definitely a good price . Grinding down cinnamon sticks can become tedious especially when the grinder overheats. Having this on hand really helps for pastry making and just enjoying in odd things. When I say odd things, I mean like tea for example. Add a little bit in tea to sweeten and spice the drink. Works sometimes but not always. Another great spice from Regal. It fits very nicely on our sweet potato casseroles and dishes. Its very easy to dispense and the tall, slim bottle fits nicely in our pantry. Kids love cinnamon sugar on their toast and after cleaning up the mess of combining the two - I discovers this gem! The kids are thrilled to just sprinkle and go. Thank you! It is what it is. Taste great and is kind of just want to those things that's great to have around. You can sprinkle it or you can use a measuring spoon just like any other spice that regal makes. And it's priced decent. Unfortunately, the batch I got must have been made right after the onion powder. It tasted strongly of onions, which was not a good thing for my cinnamon sugar donuts. I tried this product because I thought it would be easier, but I will just stick to mixing my own cinnamon sugar. Thank you for the review, Bridget! We're sorry to hear that the product did not taste as it should. We'd like to address this issue. A Customer Solutions Representative will contact you about this right away! Great tasting and great for seasoning. We have used this on many of our recipes and proved to be a real hit as a topping for items like coffee. It makes my life way easier to have found this product. No more wasting time in making this myself. It worked out great on snicker doodle cookies, tastes delicious. Cheapest price for cinnamon sugar I could find anywhere. It is also the best tasting one as well. I would definitely recommend this product. It tastes great on toast. Excellent mix of sugar and cinnamon real time saver for the topping of our fruit cobblers and apple crisp and of course sugar cinnamon toast. This cinnamon sugar is great product. This is the best price for what I have seen so far! It came in very quickly and packaged great! I will highly recommend it time after time. I use this every day for toast at home and at my restaurant for my mammoth cinnamon buns. Purchasing this Cinnamon Sugar mix has been helpful in rolling snickerdoodle cookies. i no longer have to measure each separately. I do however, like to add a few tablespoons sugar to this mix to up the sugar/cinnamon ratio to my tastes. I love the Regal brands of spices. They are cost efficent through Webstaurantstore.com. I really liked how they package their products and I have not yet had an issue with anything! This product is bargain priced but doesn't lack Taste. Comes in handy as we put this on anything from toast to soft pretzels. Very Yummy! We make popcorn on a regular basis and are always looking for ways to improve it. Since the prices here are so low, we decided to try out some Regal Cinnamon Sugar on our popcorn. Along with some coconut oil, it makes an excellent dessert popcorn. It will also be great for cinnamon toast and snickerdoodle cookies. Will be purchasing again. I have tried different blends of sugar and cinnamon for our cinnamon sticks to make good cinnamon stick seasoning. The Regal blend is perfect. I will be buying more. Great combination -- not to sugary - not to cinnamon-y Can't beat the price! Looking forward to it on my toast in the morning yum! I have been looking for the perfect blend of Cinnamon-Sugar, not too sweet, not too cinnamony and I have final found it in this Regal Spice! Very tasty on my sweet potatoes & cinnamon toast! Having this pre-made is really a nice time saver. Just sprinkle some of this onto toast or anything else you might want to brighten up and it really is good. It tastes exceptional and you get a ton of it! This was my first order and everything went smoothly. I was cooking for some of our staff at work and made cinnamon toast for them one morning and this was a big hit. This cinnamon sugar is just the right amount of sweet and spicy to meet our needs. The value is far better than the name brand. Regal Cinnamon Sugar Great amount for the price. Very fresh smell and taste. Great for french toast, cinnamon rolls and any baked goods. Very happy with this purchase. I was a little surprised when we received the 16 oz. Regal Cinnamon Sugar. The container was only half full. We weighed it though and it was a full 16 ounces. It just looked a little strange. The quality is good, and I'm overall pleased with the product. Added the Regal Cinnamon Sugar to banana nut bread recipe to enhance it a bit and came out awesome. Good quality spice blend. Definitely a must try.